Ever wondered why it's so difficult to find a great A Clarinet? It’s because most A Clarinets were designed as mathematical extensions of a Bb Clarinet. Not The MoBa A. The MoBa A Clarinet dispels every myth and misconception you have about the A Clarinet. Impeccable tuning in all registers and yes, even on the Low F, this clarinet is your greatest ally on stage, in rehearsal and in high-stress auditions. 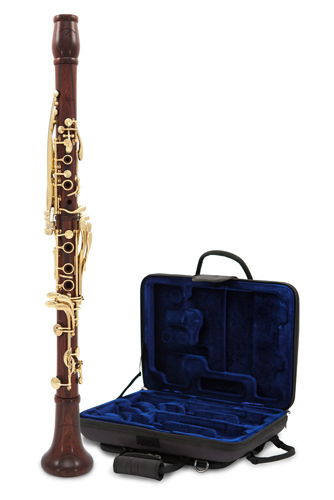 With all of the features of the MoBa Bb Clarinet, the MoBa A incorporates a unique Automatic Low F Vent mechanism for optimal tuning. Each MoBa A Clarinet is tuned and voiced to Ricardo Morales’ unwavering standards. Ricardo never makes sacrifices. Why should you? The Cocobolo wood is generally agreed to give a warmer, softer tone than the Grenadilla which has more brightness and punch. Our suggestion is to try them both if possible to see what suits you best as a player. Backun acoustical design with selected matching upper and lower joints made from highly figured, aged and exotic woods. Automatic Low F Vent activated from register key for unrivalled tuning and voicing throughout the registers. Precision fit keywork on a unique proprietary posting system manufactured in-house for long-term reliability and true touch sensitivity. Backun modular posting system designed to make key fitting and refitting precise and effortless. Carbon fibre and titanium socket fittings for upper and lower joints ensures an uncompromising fit and airt tight long lasting seal. Sculpted inline trill key design with enlarged finger buttons and an independent guide system to maintain superior alignment. Ergonomic and unique thumbrest that is fully adjustable by the player to aid in correct and comfortable hand positioning. Supplied with two MoBa barrels; 65mm and 64mm. Supplied with MoBa exotic wood bell. Supplied with a luxury double case.